Our group of five (two kids, three adults) had fun doing the Mask of Time room. For three of us, it was our first time doing an Escape Room and Mark made it fun for us. I thought the clues in the room were very well thought out and a couple were extremely tough, and we wouldn't have gotten them without hints. I'd definitely do this again! The Mask of Time is rumored to have mystical powers, providing its owner with health, wealth and immortality. You don't believe it, but an eccentric billionaire is willing to give your team $25 million reasons not to care. Using clues left behind by the forgetful museum curator, you have 60 minutes before the guard returns to; get in, deactivate the security systems and get out with The Mask of Time. 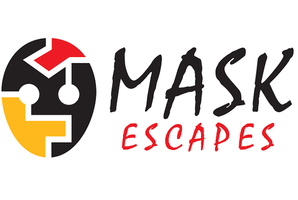 Reviews of escape game "Mask of Time"
Had great fun doing the Mask of Time room! Good puzzels, theme related and awesome host! Will definitely be back to do the other room. Awesome room! Did the mask of time room and it was well done! Good clues, keep along the theme of the room too which is slightly different then the real escape, all in all awesome experience! Mark is awesome too!